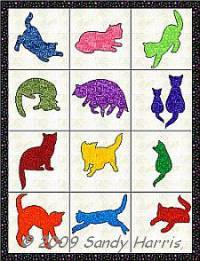 This set of 12 easy applique patterns includes left and right images in two sizes, making it easy to choose which way you want your kitties to face. Some of the large size kitties require 8" block; the small size kitties will fit 5" or 6" blocks. Includes general applique instructions; does not include detailed instructions for specific applique methods.